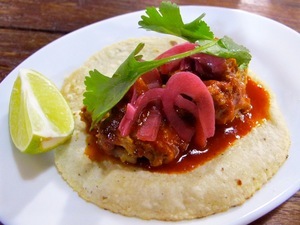 Braised pork taco with pickled red onions. Photo: © tablehopper.com. 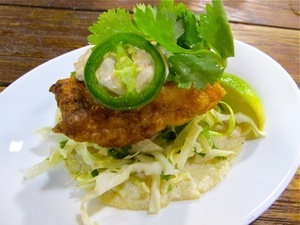 Fish taco with smoky chipotle crema and cabbage slaw. Photo: © tablehopper.com. Cosecha interior photo © tablehopper.com. Tucked in the historic Swan’s Market in Old Oakland is ~COSECHA CAFE~, the kind of place I would just love to have in my ZIP code. But it’s not (I am lighting a candle), so I had to scoot over to the East Bay rather early in order to get there before Cosecha’s metal doors rolled shut at 6pm. 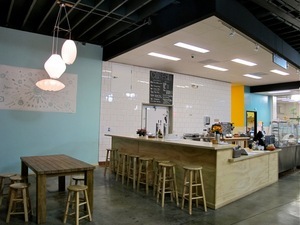 It’s more of a daytime spot (open Mon-Sat 9am-6pm), although Cosecha is now staying open until 9pm on Fridays. Score. Chef-owner Dominica Rice is quite the talent, cooking up all kinds of Mexican dishes (mostly tacos) in a Slow Food style (cosecha is Spanish for “harvest”). The ingredients she uses are sustainable, organic, seasonal, and local, from Becker Lane pork to seafood from Monterey Market. Her cooking background spans Chez Panisse, Eccolo, and Restaurant Soleil in Mexico City, so she’s doing that wonderful Bay Area thing we do of sourcing quality ingredients for authentic recipes. Everything tasted so fresh, homemade, and each dish was presented with care. Yup, these are some pretty tacos. There are seven taco fillings to choose from, including a stew-like beef barbacoa ($3.65), and our favorite, a deeply seasoned and tender braised pork ($3.65) topped with pickled red onions. Further delicious porky action: the pork belly ($4), crisp and fatty, was tamed with pickled red onions and a spritz of lime. We were also lucky to get there on a Wednesday, which is fish taco ($4.50) night: a golden and hefty piece of battered Pacific wild cod was topped with a smoky chipotle crema and presented on cabbage slaw (it’s also served on Thursdays). The made-to-order corn tortillas really are notable; they are just delicate enough without acquiring that leather-like texture that some housemade tortillas can acquire. Probably some of the best I’ve had locally—great flavor, texture, and—that word that makes many peoples’ skin crawl—moistness. It’s a casual affair: you order at the counter and then grab a seat at the picnic tables at the center of the space. Fortunately the city has just approved some exterior accordion doors that should be up after Christmas so it won’t be so chilly in there. In the morning, there is coffee and espresso service (they use ROAST Coffee Co.) and pastries before the kitchen opens (9am-11am), and I am so coming back here when the warm weather returns so I can try their iced horchata latte—sounds like something I need to know. (We enjoyed a taste of their coconut horchata.) There are a couple beers on tap, and Cosecha’s new neighbors in the market, Periscope Cellars, should be able to hook you up as well. You can like Cosecha on Facebook, or sign up for their mailing list to keep up with news and upcoming events, like their monthly Saturday night dinners.